There’s something about a fresh, perfectly ripe mango that really gets a diner’s attention. Smooth, yielding and juicy, with deep, complex flavor, lush tropical aroma and attractive yellow-orange flesh, exotic mangos are one of the most popular fruits in the world. They’re delicious as-is for a snack, but they also add excitement to so many different kinds of menu items, from spicy salsas and colorful salads to savory roasted meats, sweet desserts and refreshing beverages. Nutritionally, mangos benefit from a number of healthy attributes, yet their luscious flavor and texture speaks to indulgence. No wonder foodservice consumption of fresh mangos is growing at an unprecedented rate. A report published by Data Essential noted a notching 12.2 percent growth in menu penetration in the four-year period since 2011. And mangos are appearing in all restaurant segments, from 20.8 percent of quick-service restaurants and 30.5 percent of fast casuals to more than 42 percent in casual and fine-dining venues. A recent survey of foodservice distributors conducted by ID Report/Winsight Media and the National Mango Board revealed that 90 percent of respondents offer some sort of fresh, whole mango to their commercial and non-commercial foodservice customers. In addition to offering whole unripe mangos, 63 percent offer pre-ripened fruit and 68 percent offer fresh-cut mango. Fresh mangos have many key selling points beyond their distinctive flavor. They’re packed with more than 20 different vitamins and minerals—including vitamins C and A, folate and fiber—making them a true superfood. Yet a one-cup serving contains just 100 calories and is fat-free, sodium-free and cholesterol-free. Their versatility extends not only to various price points and menu categories, but also to different dayparts. 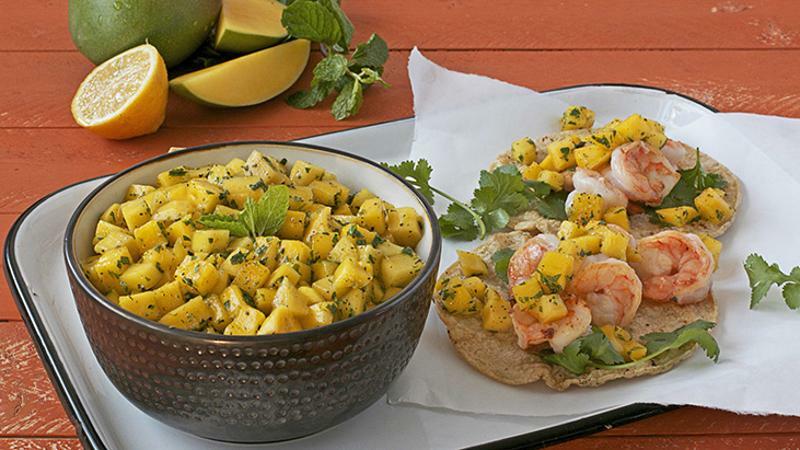 Mangos add fresh appeal to a breakfast yogurt parfait or in a lunchtime fish taco, while a mango smoothie is an all-day treat that serves double-duty as a snack. Mangos often appear in salsas, which can be menued as a bar snack with chips or as a complement to grilled chicken or pork chops in a dinner-menu signature. And mangos are always delicious in desserts, from warm-weather sorbets and fruit salads to comforting wintertime bread pudding. They can be substituted for just about any fruit in just about any sweet or savory recipe to upgrade and refresh more predictable menu items. In addition to spanning the seasons, mango travels the globe. Fresh mangos are particularly popular in on-trend Indian, Asian and Mediterranean cuisine, as well as in New World specialties from Latin America, the Caribbean and Mexico. In fact, most of the mangos sold in the U.S. come from Mexico, Peru, Ecuador, Brazil, Guatemala and Haiti. Many savvy operators have found that mangos are especially effective in LTOs, which represent an exciting way to introduce patrons to new flavors and ingredients. The National Mango Board has a number of resources available to help foodservice distributors and operators with promotional activities.